It's odd at first, but most of the foreigners in Bhopal's hotels are Japanese. There's a reason. 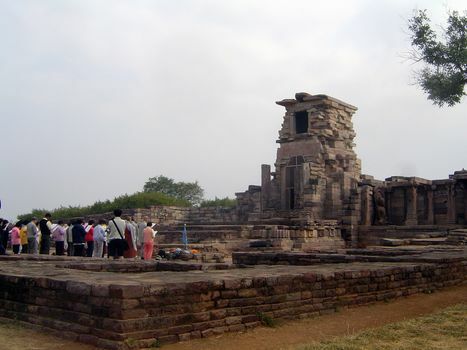 They come to pray at Sanchi, perhaps India's most spectacular Buddhist relic. 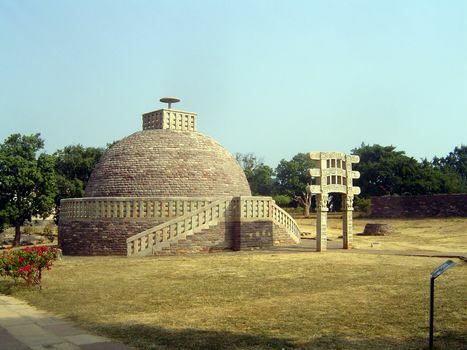 Ashoka's stupa, built in the third century B.C., was entirely of brick. 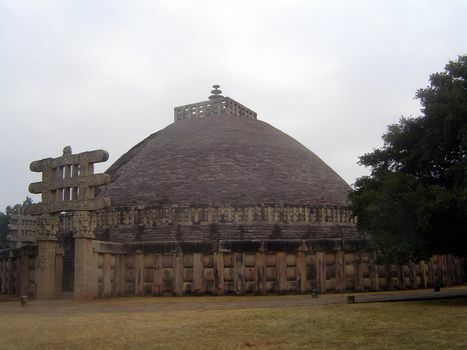 After his death and the dissolution of the Mauryan Empire, sovereignty here fell to the Sunga kings who, as often happened, enlarged the stupa by building a stone envelope around it and filling the space with rubble. 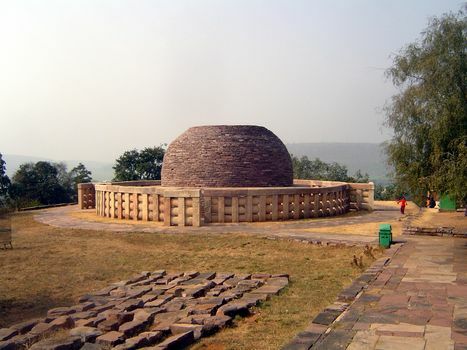 Ashoka's stupa was in this way doubled in the second century B.C. to a diameter of 120 feet. 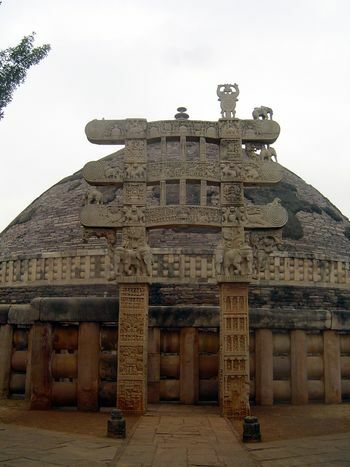 The scabs you see are what's left of the thick cement that once covered the dome or anda, which was then covered with a fine white-washed plaster trimmed with swag-like sculpted ornaments in contrasting colors. 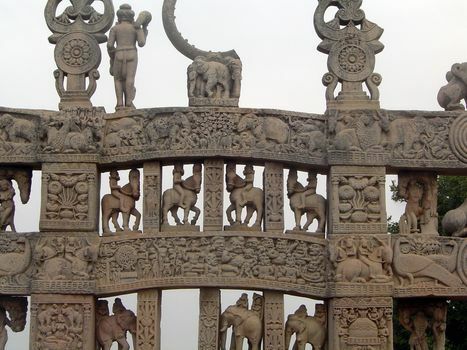 Here we look at the rear side of the north gateway. 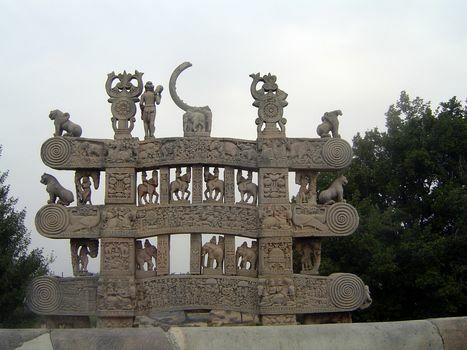 There are seven freestanding figures on the top. Fragmentary as they are, they're still in better shape than the figures atop the other three gateways. 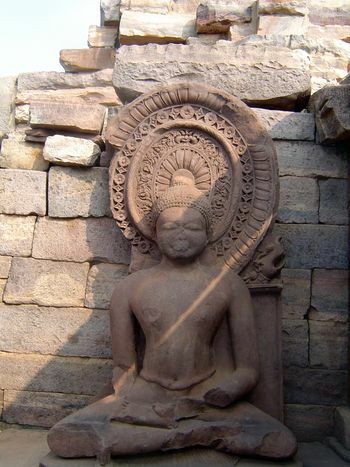 In the center is a broken dharmacakra, or wheel of the law. 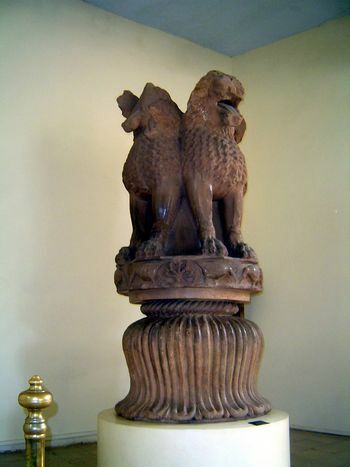 It was framed by a pair of protective spirits or yakshas, which are framed in turn by a pair of triratnas and a pair of lions. The triratna symbolizes the Buddhist trinity of Buddha, dharma (law), and sangha (the fraternity of monks). 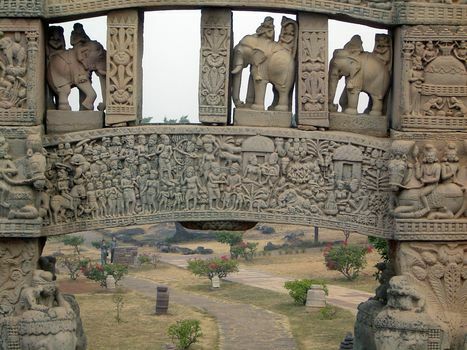 The upper architrave illustrates the Chhaddanta jataka, a story about a bodhisattva born as a 6-tusked elephant who, from pity, allows a hunter to saw off his tusks. The middle one shows the Buddha's moment of enlightenment; it's one of the four key episodes--birth, enlightenment, first sermon, and death--in the life of the Buddha. 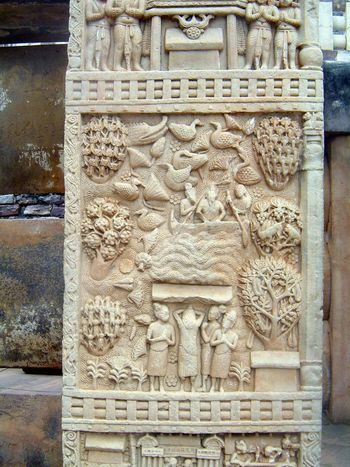 The Buddha appears as a Bodhi tree, the tree where the Buddha found enlightenment. He faces the general of the demon Mara's army; on the right are furious demons. 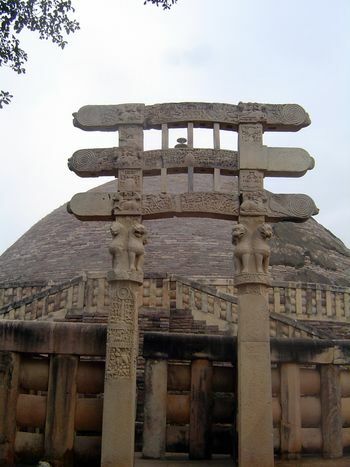 Note that there are no images of the Buddha anywhere on the stupa: until a later period, he was always represented by symbols such as the Bodhi tree or the wheel of the law. 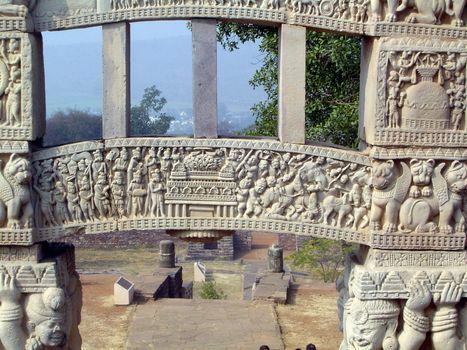 The bottom architrave concludes the story of Vessantara. Approaching the eastern gateway. 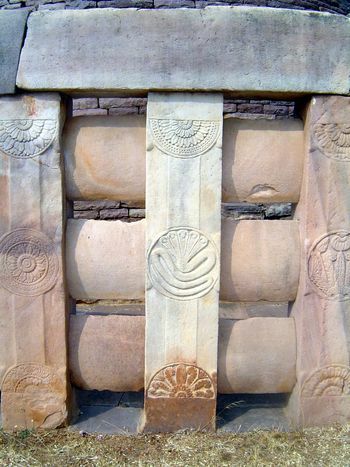 The upper architrave again shows the last seven Buddhas of this eon; the middle one shows the Buddha's departure from Kapilavastu, the city of his birth; the bottom one shows Ashoka's visit to the Bodhi Tree. Here's the rear of the west gateway. 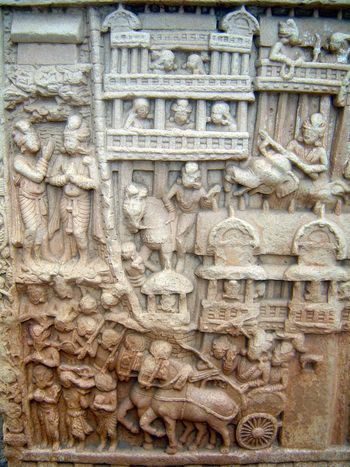 The top one shows transport of relics and the middle one the siege of Kushinagar. Marshall and Fouchet considered the dwarf capitals too bulky. 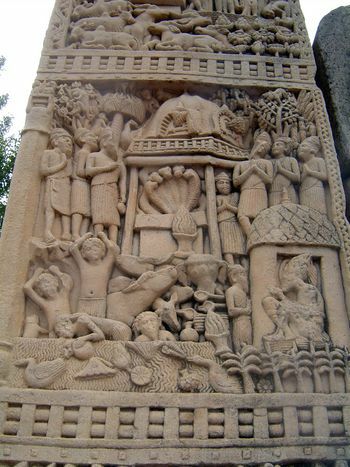 The bottom architrave according to Marshall and Fouchet shows a procession to the Bodhi tree; later interpreters see the moment of enlightenment. 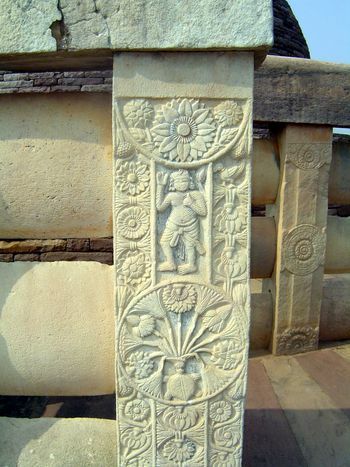 Here's the base of the front side of the east pillar of the north gate, showing the miracle of Sravasti. 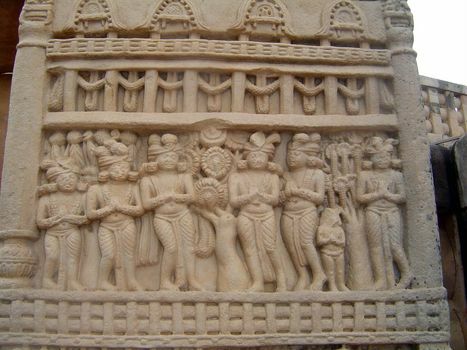 The skeptical court of Prasenajit watches as the Buddha walks in air. 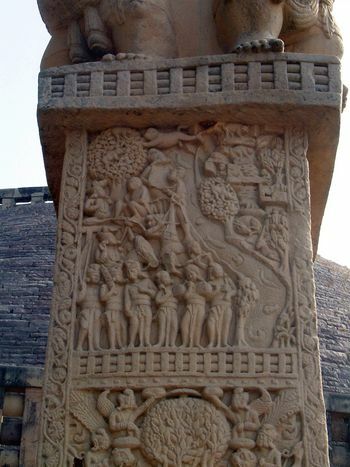 Front face of the south pillar of the east gate: skeptical disciples attempt to rescue the master from a flood (note the crocodiles and geese) but find that he is miraculously walking on dry land in its midst. 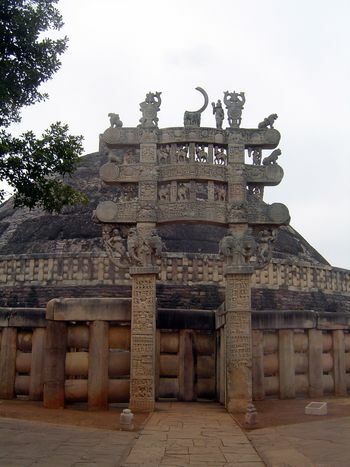 The front face of the south pillar of the east gate shows the conversion of the Kasyapas, Brahmans whose temple had a fearsome fire-breathing naga. The Buddha entered where no one else dared, and the serpent crawled meekly into his begging bowl. 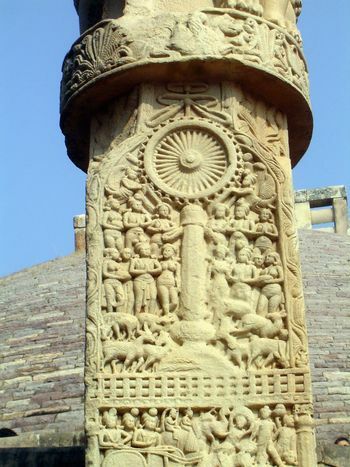 Tne front side of the west pillar of the south gate shows the Buddha's first sermon, preached at Benares to the four guardians of the world, the lokapalas. 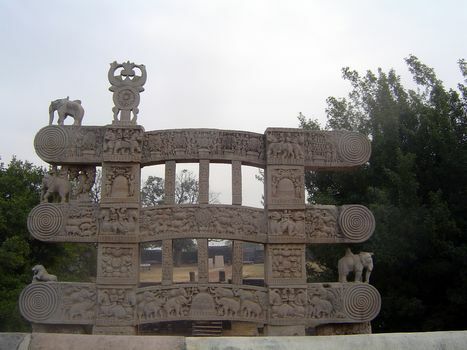 The front side of the south pillar of the west gate illustrates the Mahakapi jataka. 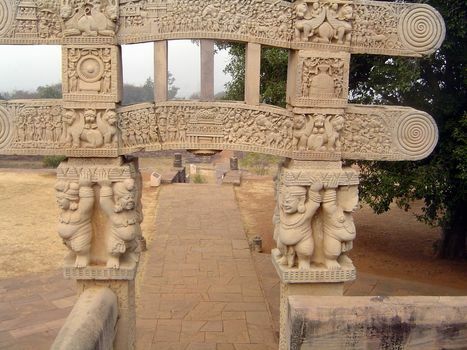 Monkeys escape over a bridge made in part by the body of the bodhisattva who is helping them escape from a king who may do them harm. 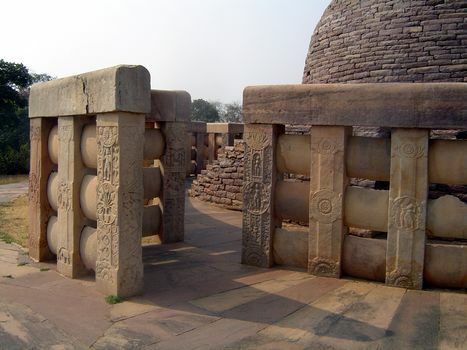 There are many other subsidiary remains at Sanchi. 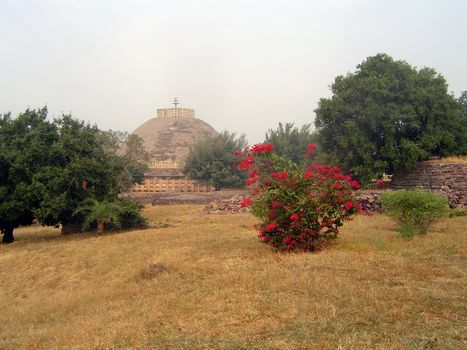 Here, near the great stupa, is stupa 3, restored from a heap of rubble by Marshall. 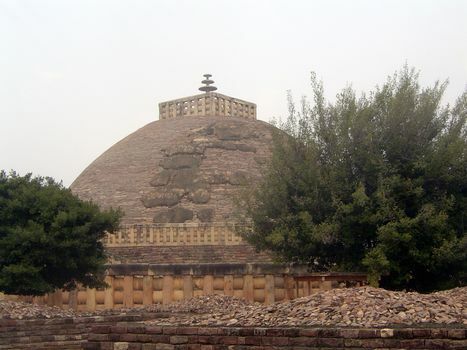 A thousand feet down the slope of the hill is Stupa 2, with relics of Buddhist authorities from the approximate time of Ashoka. 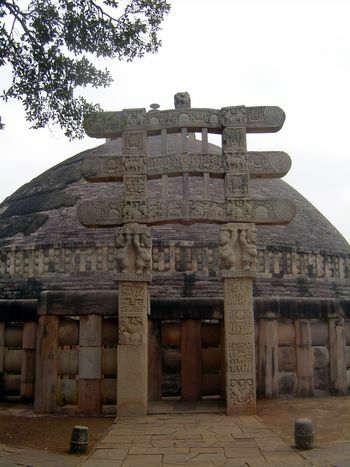 A sandstone relic casket, with the names and burnt bones of the teachers, was found inside the stupa by the British in the 1850s and is now in the British Museum. 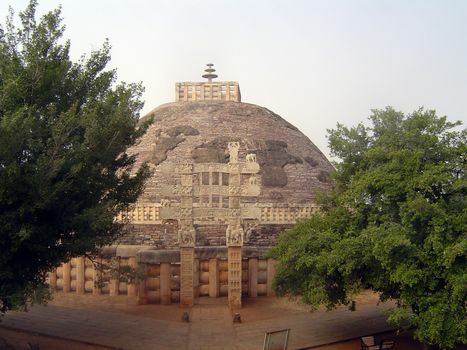 The stupa is chiefly remarkable, however, for something you can't see from this distance. 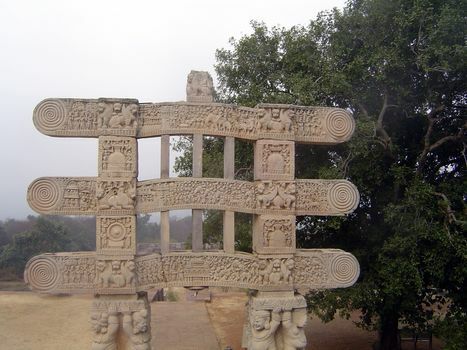 The characteristic Buddhist balustrade or vedika consists of posts (stambha), crossbars (suci), and coping (ushnisha). 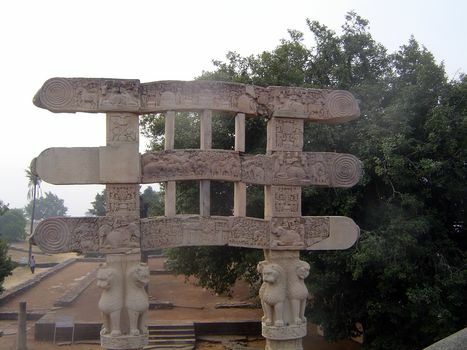 The great stupa's balustrade is devoid of ornament; here, however, the posts are covered with decoration, typically the lotus, a symbol of immaculate conception because its flower appears on the muddy water's surface as though from nowhere. As though anticipating what John Ruskin would so admire in the Doge's Palace, the carvers here created 70 unique lotus images. 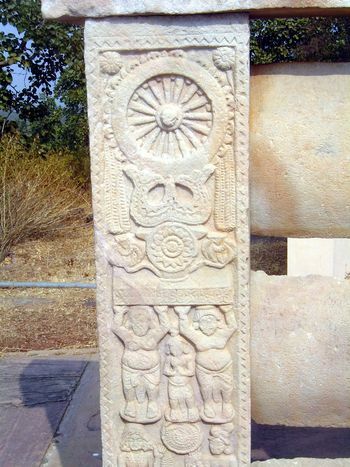 There are other images, too, including this wheel of the law, supported by a Triratna.